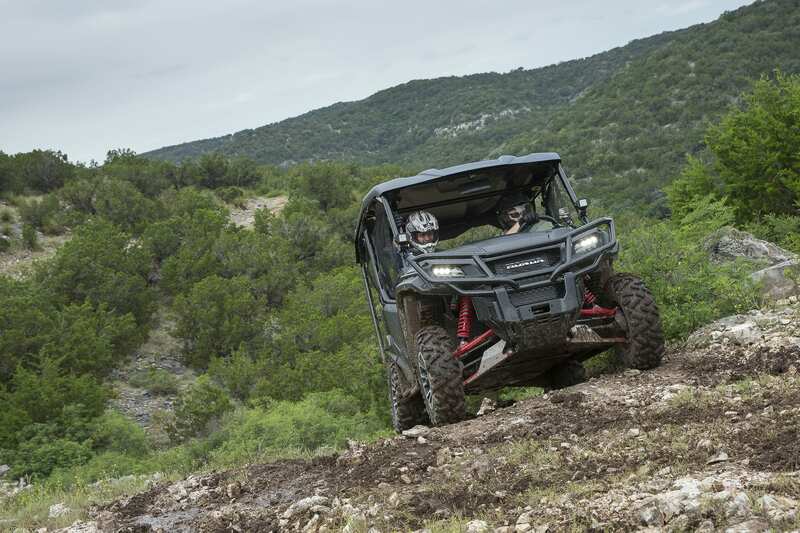 The state of Texas is a huge expanse of open country with a wide variety of terrain. The warmer climate and arid environment makes it a natural place for large hunting ranches that cater to exotic species, like those found on the plains of Africa. But it is another non-native species that has been getting all the press lately, and all for bad reasons. 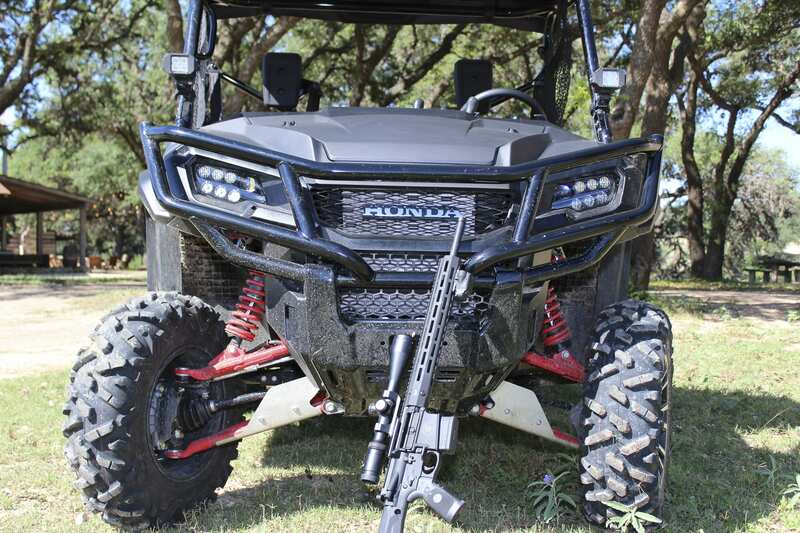 Wild hogs have become a nuisance animal across the state and many others, so hunter are encouraged to shoot as many as they can. 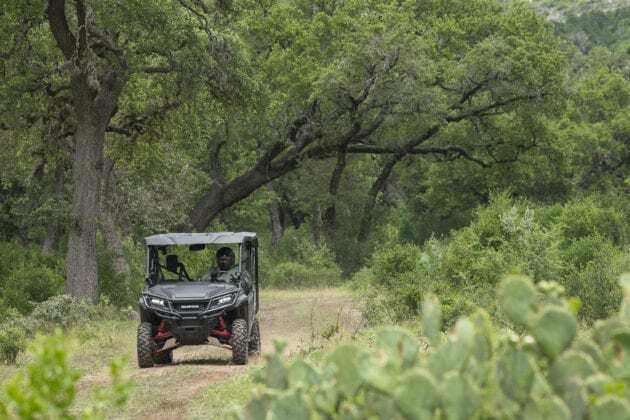 When Honda chose the 18,000-acre Ox Ranch, near Uvalde, Texas, as the location for the premier ride for the 2017 Honda Pioneer 1000 LE, it seemed like a natural fit to add in a little hog hunting action to go along with the ride. When Honda released the Pioneer 1000 last year, they were already fast at work on the new LE model. It took additional time to perfect the systems that they were designing into the line, so it gives them a new machine to make a splash with this year. So how new is it, you ask? There’s a lot to like about the new unit and it made for an even more memorable hunt. 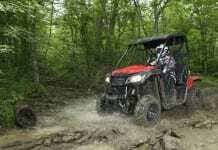 The big news is the i4WD system. Describing it is rather lengthy and would take a lot more space than this article can provide. In a nutshell, the new system replaces the diff-lock 4-wheel drive from the previous model with a system derived from the automotive side. The system notices which wheel needs traction and adjusts the power distribution. Think of it like an on-demand all-wheel drive, except that it allows both differentials to unlock and lock without input from you. 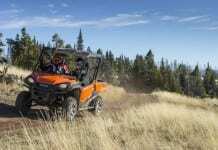 You get all the benefit of a locked four-wheel drive system yet have the handling and control of an unlocked differential. We hit some slick rock sections on some gnarly uphills and the system walked through these areas with minimal wheel spin yet retained the amazing handling. Another new feature that was put to the test is the Hill Start Assist. We stopped several times on the side of a hill. You have your foot on the brake and you push the assist button until the light comes on. When it is time to go, you simply take your foot off the brake and give it gas. The system maintains the braking for several seconds, allowing you to use only your right foot for gas. No more doing the two-foot two-step dance to keep the machine from rolling backwards on a hillside. And then there’s the shocks. I can’t write about them without smiling. 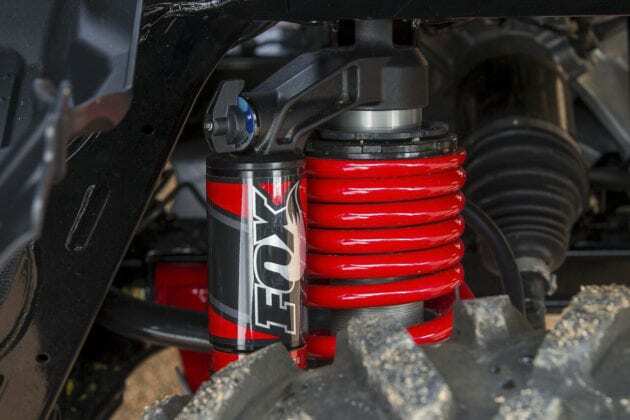 For the LE, Honda added FOX QS-3 shocks with 10-55 inches of travel up front and 10 in the rear. While the standard Pioneer 1000 has good suspension, the LE with the new FOX shocks has awesome suspension. You can make quick adjustments without tools with the dials on tops of the shocks and the action was leaps and bounds better. 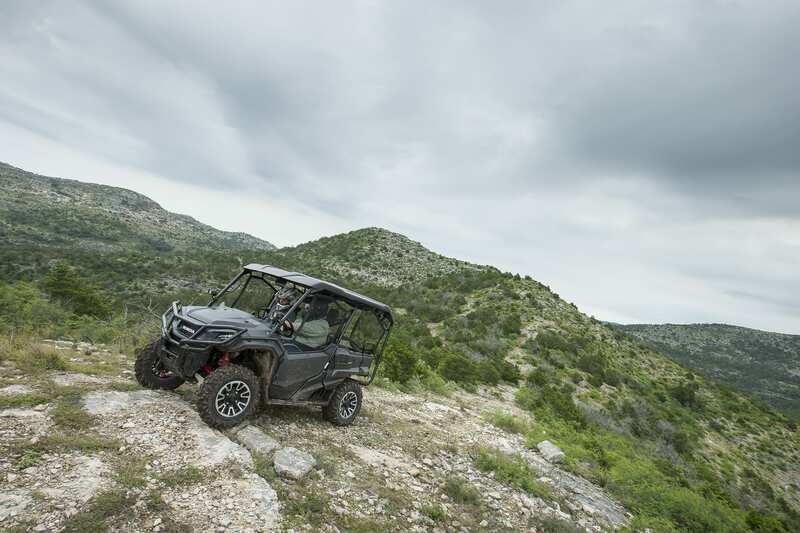 You can hit obstacles and G-outs without fear. While on the hunt, the machine would float over washouts and through ruts without passing on the impact to the driver or passengers. To make the LE a little more special, Honda added a slick-looking gunmetal grey finish, painted the A-arms red to match the shocks, and added a cool brush guard and aluminum skid plates. The whole package is definitely worth the extra money, as this is a premier machine for the company. Wild hogs have become such a wide-spread nuisance species across much of the American South that hunting regulations for them are about as liberal as can be. The problem with these animals is that their destructive capabilities are only matched by their reproductive ability. A sow hog can have a little of piglets at six months and the size of the litter can be 10 to 15 or more little piggies. Once they become sexually mature, a sow can berth up to three litters each season. The speed with which a population can expand is mind blowing. To feed these growing populations, hogs can devour fields of plants, as well as eggs of native bird species that ground nest, small mammals are also on the menu and much more – pigs eat just about anything. Hunting wild hogs can be like shooting fish in a barrel, however it is still hunting, so there is no guarantee. As was the case this go around, as only a few hogs fell to hunters on this trip. But the hunt was exciting none the less. Our first expedition was a night hunt, using tactics right out of tactical modern warfare. We donned night vision goggles mounted to tactical helmets, and used brand new Smith & Wesson Performance Center M&P10 rifles chambered in the hot new 6.5 Creedmoor round. These rifles are capable of serious accuracy out to ranges past 1000 yards. For this hunt, we were expecting close action and used Crimson Trace LiNQ, weapon-mounted laser sights. This is where things got a little crazy. We used black tape to cover all the lights on the dash of the Pioneer. Our guides on the ranch used infrared spotlights and the night vision goggles to illuminate the night. So, while we could see where we were going, and where the laser sights were pointing, if you looked without the aid of the gear, the scene was pitch black. Imagine going at a high rate of speed in a side-by-side with no lights. The plan was to drive out into the ranch and find the hogs as they fed on food left out for the numerous exotic game species. When a hog was spotted, the plan was to drive quickly after it, while taking aim with the laser sighted rifles and firing. And when we say exotic game, we mean it. 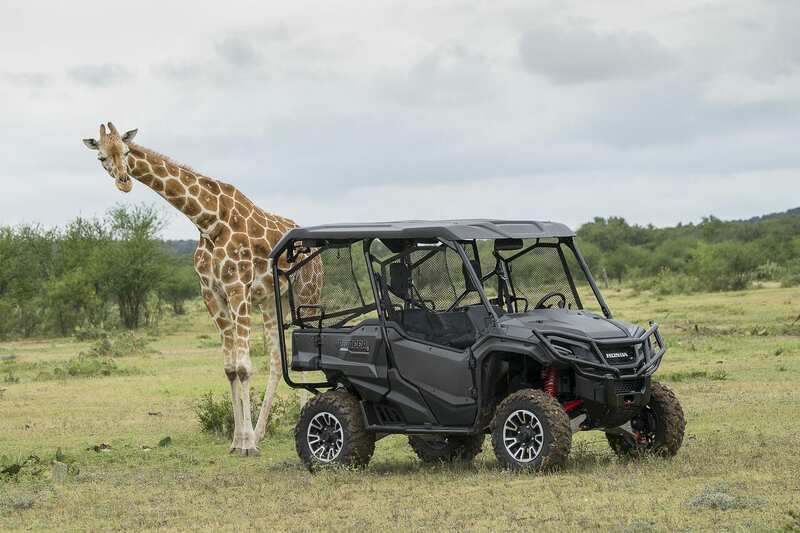 We’d pass though herds of blackbuck antelope from Africa, monstrous Asian water buffalo, and giraffe – yes giraffe. It was much like driving through a wild zoo safari style, in the middle of the night, with no lights on, night vision gear and armed to the teeth. A few of our party was successful in the hog hunting, but alas, on this trip, the hogs did not cooperate. Still, it was an experience we’ll not soon forget. If a night time tactical hog hunt is something you’d like to experience, and let’s face it, who wouldn’t? – Give the Ox Ranch a call. 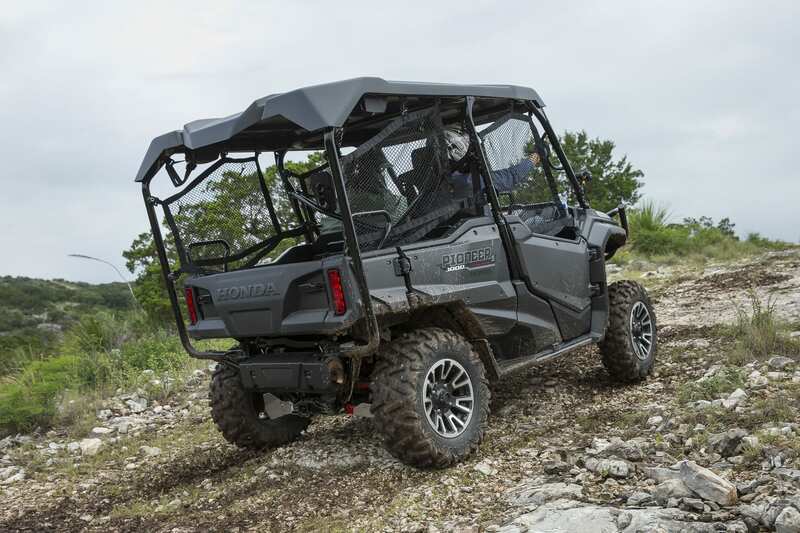 For any other adventure, you’d care to take on, the new 2017 Honda Pioneer 1000 LE is up for the challenge. 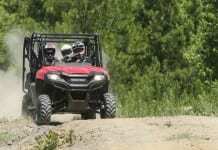 They aren’t cheap, starting at around $20,000 U.S., but for that, you get a completely capable recreation and utility machine with amazing suspension and the new 4-wheel drive system. Add to that the features the Pioneer 1000 was already known for, and you’re looking at a ride you can take anywhere and do just about anything with. 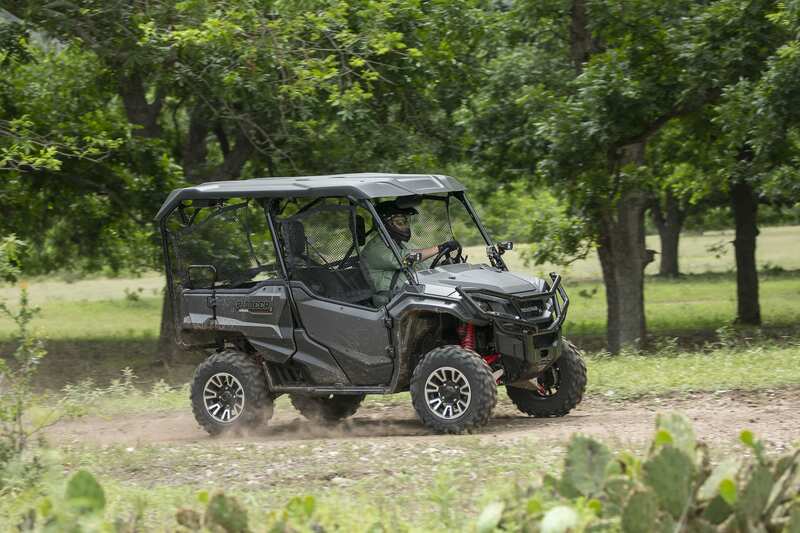 In the crowded side-by-side market, the Pioneer LE is a standout and rightly so.